As dissatisfied consumers return purchases of rival set-top-boxes in droves, Apple's market-leading Apple TV continues to achieve moderate success, selling roughly 500,000 units per quarter as the 2011 holiday shopping season approaches. The latest update to Apple's $99 streaming media box arrived last fall and within just a few months went on to sell a million units. Since then, Apple has provided no update on sales of the device, but Concord Securities analyst Ming-Chi Kuo tells AppleInsider that his industry checks indicate the company shipped 480,000 units during the second calendar quarter of the year, representing more than 70% year-over-year growth. Although Apple continues to see Internet television devices as a nascent category, frequently referring to the Apple TV as a "hobby," when sales of the device are pit against its peers, the Apple TV appears to be a runaway success. For instance, Logitech said this week that "very modest sales" of its $249 Google TV-based Revue set-top-box were exceeded by returns of the product from unhappy customers, prompting the company to slash pricing by 66% to match Apple TV's $99 price point. The move will reportedly cost the device maker some $34 million in one-time charges as it hopes to remove price as a barrier to broad consumer adoption. The failed partnership with Google also contributed to a $29.6 million loss for Logitech during its fiscal first quarter, prompting the exit of chief executive Gerald P. Quindlen. Looking ahead to the second half of the year, Kuo said his industry checks have turned up no evidence that Apple plans to push a hardware revision to the Apple TV into production during the third quarter. Instead, the Cupertino-based company will reportedly take a more measured approach to advancing the platform in 2011, relying instead on an Apple TV Software Update this fall that will allow devices such as the iPad 2 and upcoming iPhone 5 to beam their content to the big-screen. The technology, dubbed AirPlay, essentially allows devices equipped with Apple's A5 processor and the forthcoming iOS 5.0 update to mirror their video content from supporting applications to HDTVs hooked up to an Apple TV. While ideal for sharing video with friends and family, the feature is even more significant for Apple's encroachment on the gaming market, as it will allow any iOS game developer to offer console-style gaming (demos below) by which the the iPhone or iPad transforms into a wireless controller, equipped with gyro sensors and touch-screen controls. 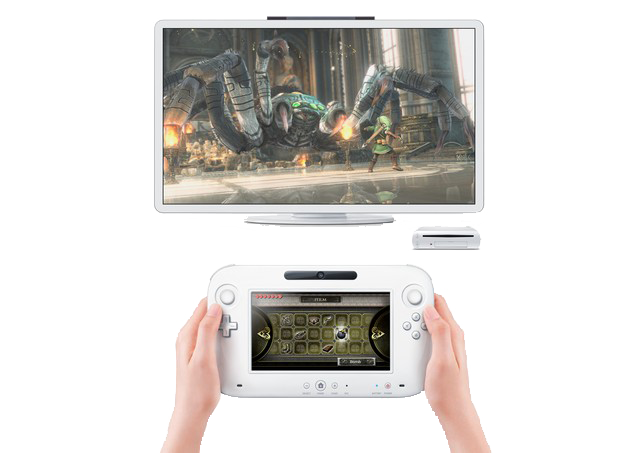 Caught in the crosshairs is troubled console maker Nintendo, which now plans to race to market with a competitive product called the Wii U —a 6.2-inch touchscreen wireless controller with similar capabilities —such as a gyro and camera —that it claims was under development long before Apple introduced the iPad. The world's largest video game maker revealed Thursday that it continues to bleed cash, posting a net loss of 25.5 billion yen ($324 million) for the three-month period ended June and prompting the company to slash the price of its 3DS handheld to $169.99 from $249.99 beginning August 12. And the outlook for the Kyoto, Japan-based firm's fiscal year doesn't fare much better. It's guiding net profit of 20 billion yen, down 82 percent from its previous outlook, on sales of 900 billion yen —blaming the skid on a shortage of hit titles for the Wii and 3DS. Meanwhile, Apple continues to struggle with the second prong of its Apple TV strategy: HD video content. Unlike the inaugural Apple TV that offered a trove of archived television content priced between $2 and $3 an episode, the company continues to face opposition from networks who feel the new Apple TV's $0.99 per episode HD rental model devalues their content, according to people familiar with the matter. Over the past year, Apple has failed to reach licensing agreements with content producers that would have them join Fox and partner Disney, for which Apple chief executive Steve Jobs is a director and largest individual shareholder, in providing their television content to Apple TV users. As such, Apple is now reportedly in talks to grow its streaming video business through a potential acquisition of Hulu, an ad-supported streaming service that offers video content from NBC, ABC, USA, Bravo, FX, A&E, and numerous other television networks. "[W]e love the product. 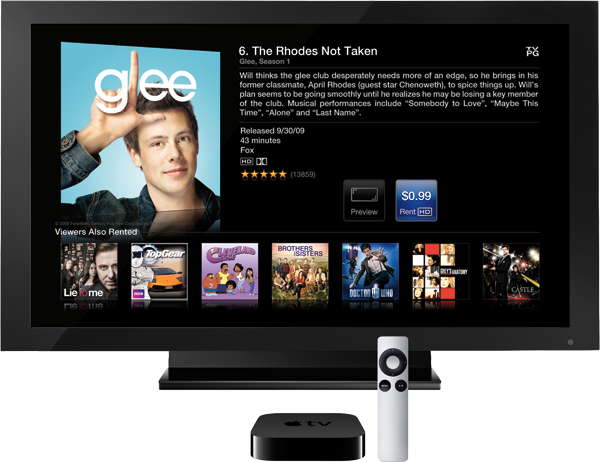 It's clear that customers love the product," Apple chief operating office Tim Cook said this month of the Apple TV. "We really guided right when we went to the new Apple TV just last fall. But right now, it's still a hobby status that we're continuing to invest in it because we think that there is something there."